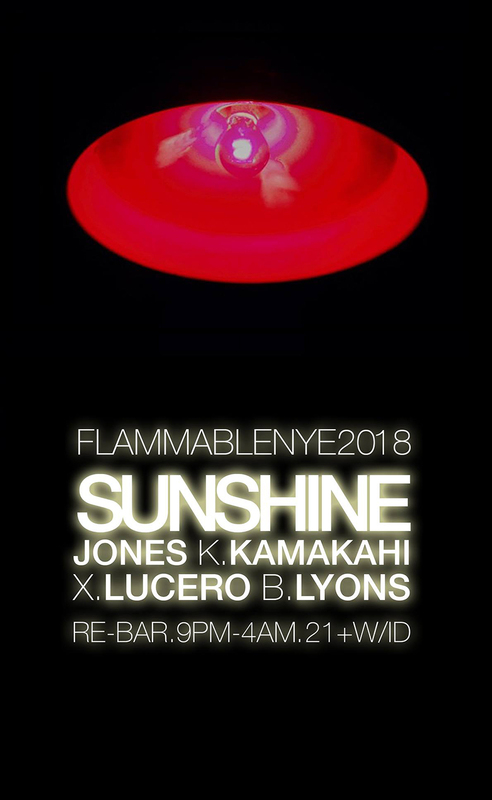 sǝuoſ ǝuıɥsunS » Sunshine Jones – Live at Flammable – New Year’s Eve 2017/108 – Seattle, WA!!!! Sunshine Jones – Live at Flammable – New Year’s Eve 2017/108 – Seattle, WA!!!! I bet you thought I was really going to stay home and bang a pot at midnight on New Year’s didn’t you? I know in my “rest of the year” poster I talked about that, and you know what? A cozy evening with a log on the fire, a fantastic home cooked meal, some deep conversation with jazz playing sounds amazing – so amazing that I’m gonna do that tonight, and drive up to Seattle for the New Year’s celebration. New Year’s Eve is a Sunday this year… that’s right. And what happens on Sunday night? Flammable. So that’s what we’re gonna do. I don’t have a deposit, or a hotel, or any idea when I’m leaving, if there’s room on the guest list, or anything yet. So my suggestion to you is that you get a ticket now. Re-Bar is not massive, and it’s New Year’s Eve baby… so don’t get stuck at home with a pot and a pan, or standing out on the sidewalk. I will sneak you in under my parka if I have to, because I love you, but don’t make me do that… get a ticket. Let’s party! I love you. See you soon!!!! A weekly Sunday night party at Re-Bar night club, one of the finest Gay clubs in Seattle, Washington. Located at 1114 Howell St., Re-Bar is home to amazing gameshow nights, fierce drag pageants, and some of the finest and most truthful dancing to be found in all of Washington state. Because New Year’s Eve is a Sunday, this is the regular Flammable night, but it’s going to be a mad house. I’m still going to pot & pan it but I love you and I love that this is happening. Hell yeah Alice Coltrane. Church!